Pines West Academy creates a challenging and enriching multicultural environment where traditional and contemporary styles of teaching are carefully integrated to produce an engaging, yet safe setting for learning. Pines West Academy promotes the fulfillment of each person’s potential by identifying the individual’s needs and goals, and inspiring them to strive for excellence. In fact, during their time in our school, all children will be endowed with experiences of success and self-esteem; essential components in the physical, social, emotional and cognitive development of young children. Pines West Academy is part of Education First Inc, a company owned by a family that is passionet about education and has been involved with it for over 20 years. We take children as young as twelve months old and we do potty training in our school. Yes, our curriculum is based on developmentally appropriate international standards of education for young children. All activities are age appropriate. Learning objectives are set for each student according to individual needs. 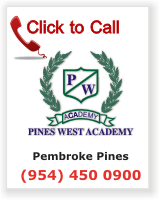 Pines West Academy promotes fulfillment of each child’s potential while striving for excellence. Pines West Academy employs loving, bilingual teachers who do not only have a degree in Early Childhood Education, but who have also been specifically trained in delivering an International Curriculum. Our teachers are facilitators in-charge of guiding children in their process of discovering the world. Teachers are in a permanent quest to get to know each and every one of the children's needs, styles, and interest in order to better provoke and inspire them to learn and search for solutions to their own inquiries. Our teachers also understand the importance of encouraging a clear set of values, skills, and knowledge in an inviting, loving and friendly way.